She’s the USA Today Best-Selling author of The Oakwood Mystery Series, a trio of Cozy Mysteries that take place in the all too real city of Oakwood, Ohio, where murders are rare but great stories lie thick on the ground. In addition to writing about murder, she also teaches writing at a local community college. After the written word, Leslie’s passions include her husband, her son and daughter, hiking, tennis and strong black coffee, not necessarily in that order. 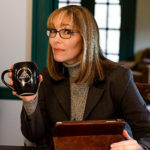 USA-Today Best-Selling weaver of Cozy Mysteries, Leslie Nagel, joins us on the show today to talk about The Oakwood Mystery Series. Listen to “LESLIE NAGEL – PDI-2018 Adventure #9” on Spreaker.